Attitude - determines your Altitude and how high you will fly in this life. Brainpower - is the best demonstration of who you are. Courage - to face all that life offers. "Patricia Russell-McCloud is the greatest orator of our time. Now, she brings the same power and magic of her speeches to the printed page in A IS FOR ATTITUDE." 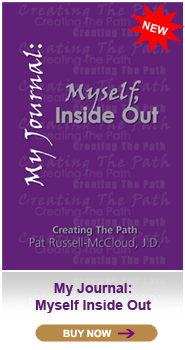 Pat Russell-McCloud, J.D. is a phenomenal speaker. Each year, she speaks to more than 100,000 people in audiences across the nation in a broad spectrum of arenas. She has been respectfully dubbed “The Alphabet Lady” for her rousing motivational messages that give attitude a major adjustment.